Most users feel difficulty to setup FTP/SFTP client like FileZilla to transfer files on HP Helion Public Cloud. Here is guide on HP Cloud FTP setup. We will soon deliver optimized IaaS platform to use your common web softwares on multiple OpenStack based Cloud Computing Platform. In case you are client of Alpha, Beta or Stable platform, you need not to setup them (hence you need not to follow the HP Cloud FTP/SFTP Setup : Router, Subnet and Security Group Settings subheader), they are ready to be used for SFTP. Our system engineers will send you a setup file for FileZilla. You can be running Nginx or Apache2. You might not be running vsftpd. You must clarify the Router and Subnet Settings from our previous article. You must be aware about the difference between SSH and FTP. We are using SFTP, not FTP. Often FTP and SFTP are interchangeably used. For security reasons, you can enable/disable the ruleset when you are really not using SSH and/or SFTP. Settings here will override Operating System level settings. Do not argue why Ingress and Egress both are set. They are needed for practical usage. You can delete rules later. Browse to the location of your .pem file and select it. FileZilla will seek your permission to convert the file into .ppk format. Accept it, then give the file a name (does not matter what name) and store it somewhere, then continue to the next step. We added the main thing to get authorized. Now, we need to add the instance to FSTP. Basically, most of us never do this, we type the IP, type port as 22, type root as username, type password and then connect. 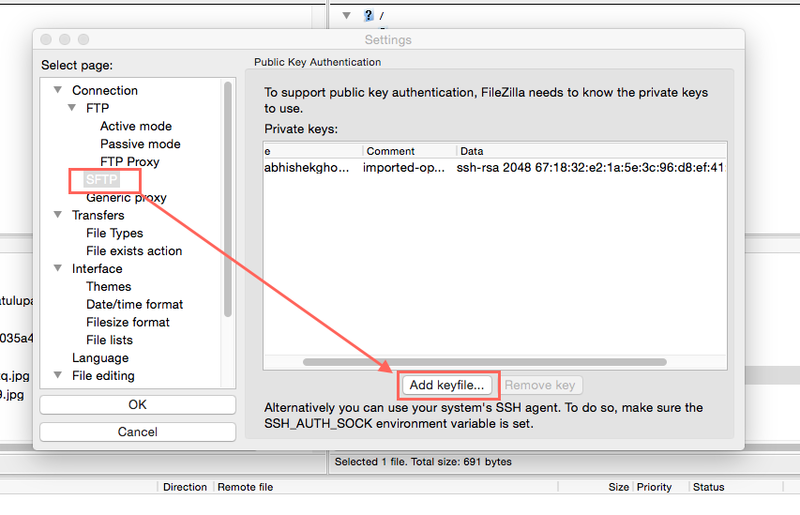 That is a secured way as FileZilla saves password on Micro(&)Soft Windowzzz in plain text format. Do not think that, .ppk file add a huge security on Windozzz. Windozzz is ported OpenVMS. Use any UNIX or unix like OS. You can use HP-UX (to make HP happy), OS X, anything which is unix. Optional advanced secured settings : As Apple can also steal data, you can change the ownership of the file to none with no set chmod value. You should, technically do the same for Ubuntu Desktop. You will only make it usable when you use SFTP. Host : Your public IP address of the instance Protocol: SFTP Port : 22 # set custom port if you are an advanced user Logon Type: Normal User: For Ubuntu, the user name is ubuntu. For Debian Linux, the user name is debian. Otherwise, root. Practically this is what you use to SSH. Password: Remove all dot stuffs - no password, blank Account: Blank Comments : Write some poetry like "Twinkle Twinkle Little HP Cloud Instance"
User: For Ubuntu, the user name is ubuntu. For Debian Linux, the user name is debian. Otherwise, root. Practically this is what you use to SSH. Comments : Write some poetry like "Twinkle Twinkle Little HP Cloud Instance"
Save it First! You will not be doing it hundred times. Later, launch a new Tab (which is Command + T on Mac), click Site Manager (which is Command + S on Mac), press the Connect button – you’ll be at /root as if someone ran sudo su && cd /root command. This Article Has Been Shared 6933 Times! Cloud Computing is explained in simple words along with the trends of Cloud Computing, trends and possibilities of Cloud Computing in future. Scalability is a feature of Cloud Computing, But what is this terminology Scalability actually means ? In this article we will discuss the technical points. Moving to Cloud : Is It Safe For Your Business ? Moving to Cloud is not simple outsourcing. It means the possibility for the companies to use online applications in all areas, needs careful analysis to adapt. Secure Cloud Computing Guide focuses on the risks of cloud infrastructure for data, points what to look for your own website or business to be on secure Cloud. Cite this article as: Abhishek Ghosh, "HP Cloud FTP/SFTP Setup," in The Customize Windows, December 9, 2014, April 23, 2019, https://thecustomizewindows.com/2014/12/hp-cloud-ftpsftp-setup/.